Martin Flyer is one of the most recognized bridal designers in America. Using the best possible materials, the brand is renowned for hand crafting the finest rings to celebrate the special moments in life. Martin Flyer was founded in 1945, by designer Martin Flyer. In 1977, the growing Martin Flyer enterprise moved to 48th Street, at the centre of New York’s famous diamond district. Today, it is run by CEO Joshua Kaufman, a member of the business’ third generation. For over 70 years, Martin Flyer has held the motto “The Quality You Expect, The Personal Service You Deserve”. As well as creating stand-out jewelry pieces, Martin Flyer is committed to helping consumers and retailers to understand the industry and the choices available to them. With this in mind, they created The Five Classifications of Bridal. This concept, which runs both online and in the 150 retail stores that sell the designer’s products, offers a simple way to categorize the various bridal styles that exist in the marketplace. This then distinguishes between classic, vintage, and contemporary styles, with looks to reflect different brides’ personalities. Martin Flyer offers hundreds of glamorous designs that really stand apart from other jewelry designers. Their elegant, timeless designs are beautifully hand crafted from the finest 18k white and yellow gold, platinum, or palladium, with stunning side-stone diamonds. If you’re looking for something more unique, delicately colored diamonds can also be integrated into the designs. When it comes to designing your engagement ring, the Martin Flyer’s user-friendly website allows you to start with your setting or your diamond, or you can also select from a large collection of complete rings. Once you’ve chosen your ring setting and diamond shape, you can then specify your budget and use the expert selector to help identify the best possible diamonds and settings for your needs and personal taste. The process has been designed to be as easy and hassle free and possible and it’s fair to say that it lives up to that promise. When it comes to complete rings, choose from a whole host of collections including the Martin Flyer Promise Cut, FlyerFit Ideal, Halo Engagement Ring, Non-Halo Engagement Ring, and Gemstone and Fancy Colour. There really is something for everyone! Many of the designs are also customizable and can be altered in various ways to meet customers’ individual requirements. If you’re looking for the perfect engagement ring, make sure you check out our other designer reviews, including this review of Tacori and Jeff Cooper. The FlyFit Collection is Martin Flyer’s new wedding set line, featuring a beautifully crafted engagement ring and wedding ring that fit perfectly together – representing how two people can become inseparable through marriage, without sacrificing their unique personalities. Committed to quality and longevity, each and every ring that is crafted by Martin Flyer is carefully inspected at multiple points in the production process. To give you peace of mind, all Martin Flyer engagement rings come complete with a lifetime warranty. Where can I buy Martin Flyer engagement rings? 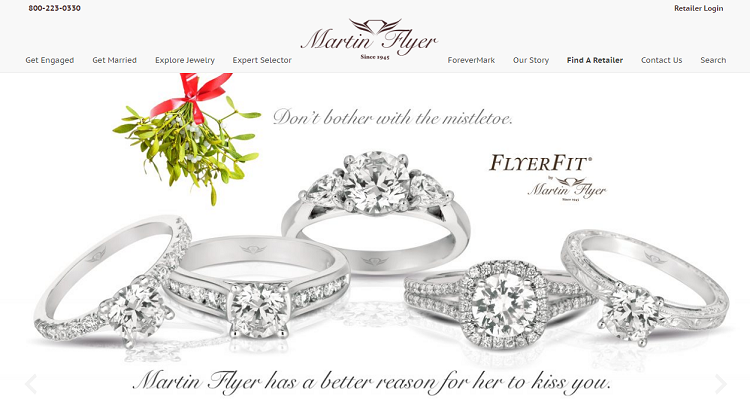 You can buy Martin Flyer engagement rings directly from the designer via their user friendly website. Alternatively, you can visit one of the 150 retailers in North America who stock the brand’s engagement rings. You can also buy Martin Flyer engagement rings from approved online sellers, such as Since 1910, James Allen and Solomon Brothers. We’ve reviewed a whole host of diamond sellers and ring designers to ensure that you find the perfect engagement ring – make sure you read our Verragio and Danhov reviews! Overall, Martin Flyer is a trusted, experienced jewelry designer who calls upon the finest materials, attention-to-detail and craftsmanship to create striking engagement rings that stand out from the crowd. With a huge range of cuts, styles, and designs, as well as an easy-to-navigate, user-friendly ring design facility, it’s quick, easy, and hassle-free to create your perfect engagement ring.